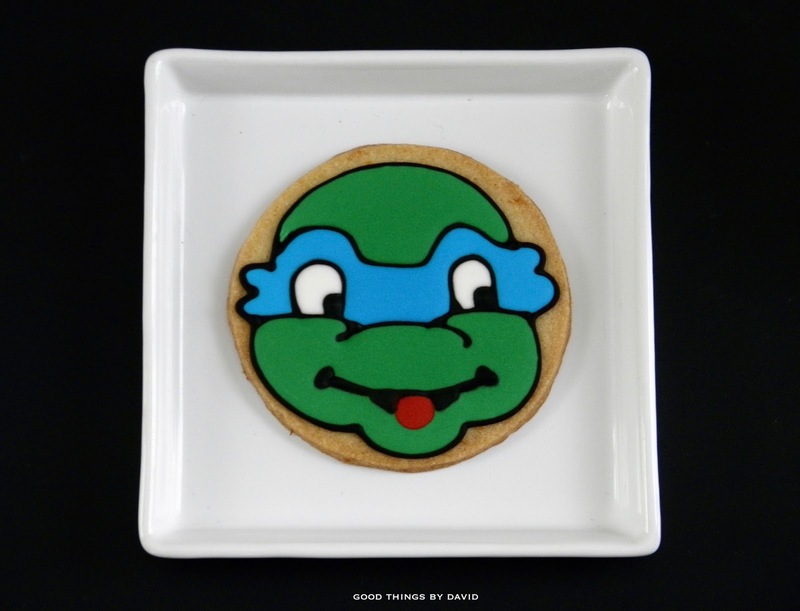 When you hear someone mention Donatello, Michelangelo, Raphael and Leonardo, you immediately think of the artists from the Renaissance. For kids, however, you are referring to the teenage mutant ninja turtle comic book characters that some of us grew up with. 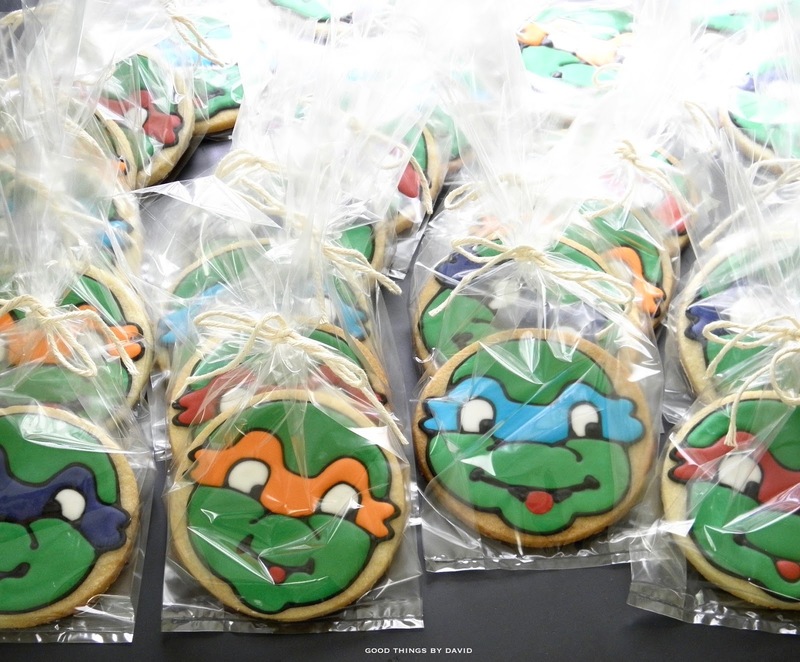 These green turtles with their colorful eye bandanas, can be turned into sugar cookies, and get handed out for a TMNT-themed birthday party. 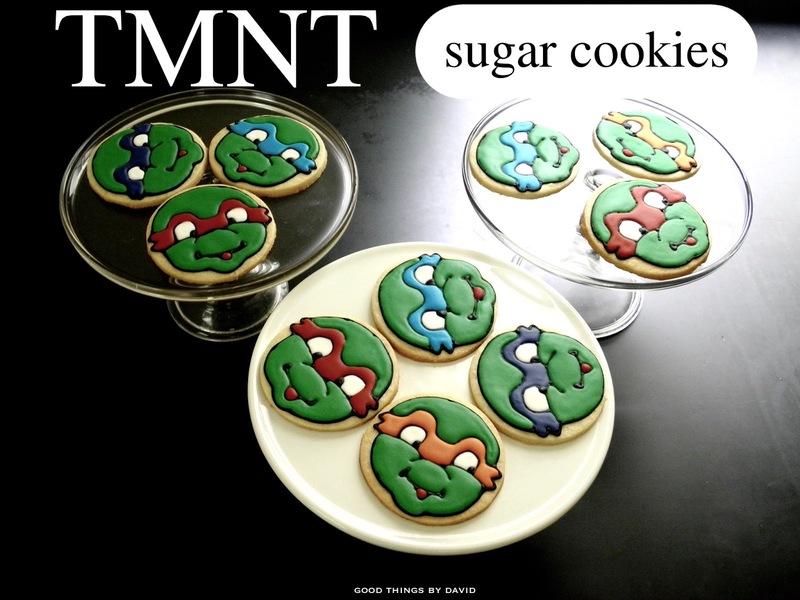 Kids of all ages are going to want them. 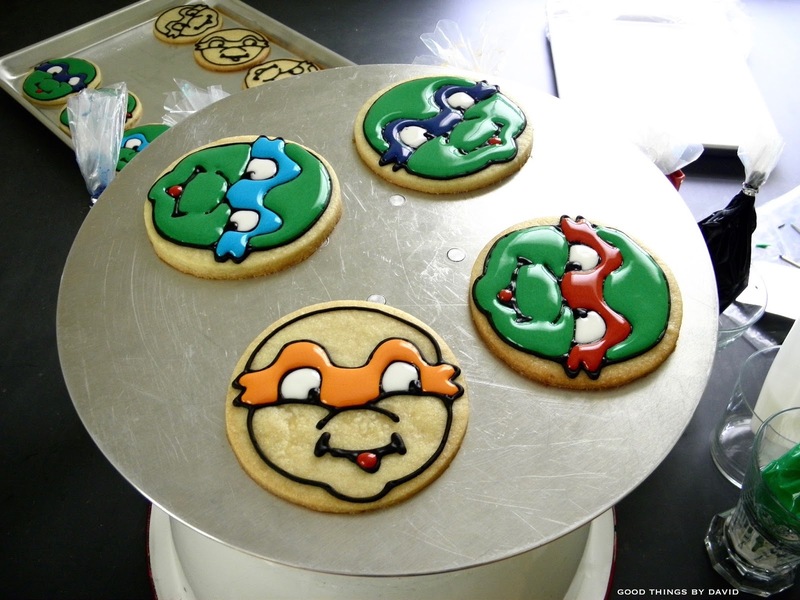 What I like about this type of cookie is that you don't need to have a specific TMNT cookie cutter or a myriad of designs to create a set. They can all be iced and finished with one face, and a handful of colors of royal icing. 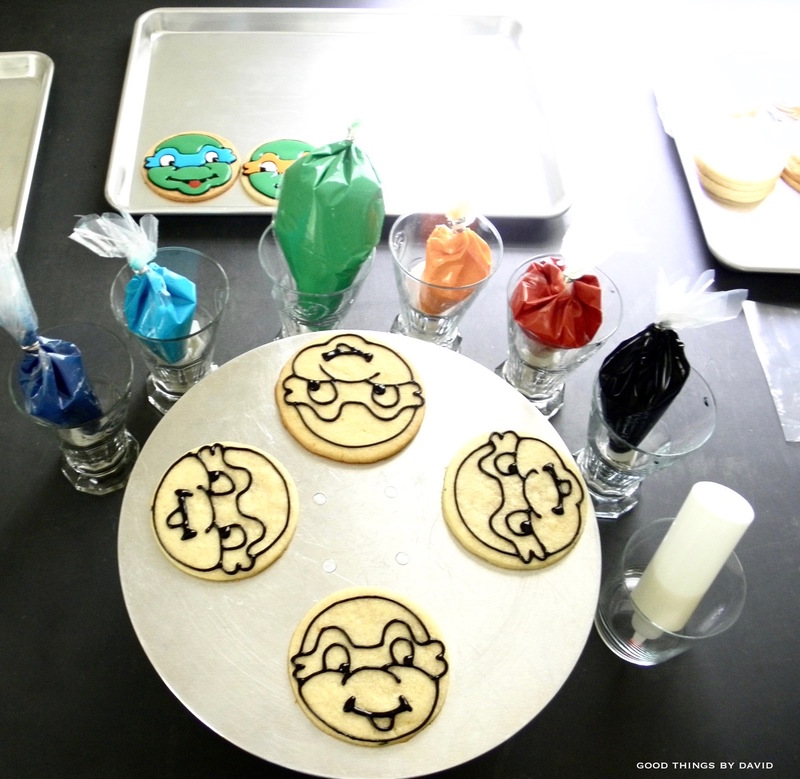 Whether you cut out round or square sugar cookies, the faces can be outlined freehand in black royal icing. 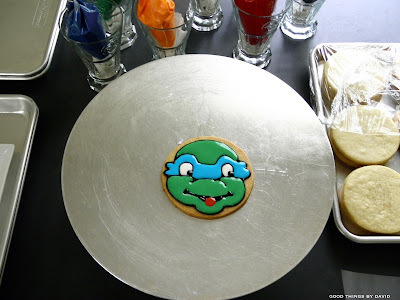 If you're unsure about doing this freehand, you can always use a food coloring marker to trace out the design before icing. All that is left to do is to fill in the blanks. This one cookie shows you the basic design. 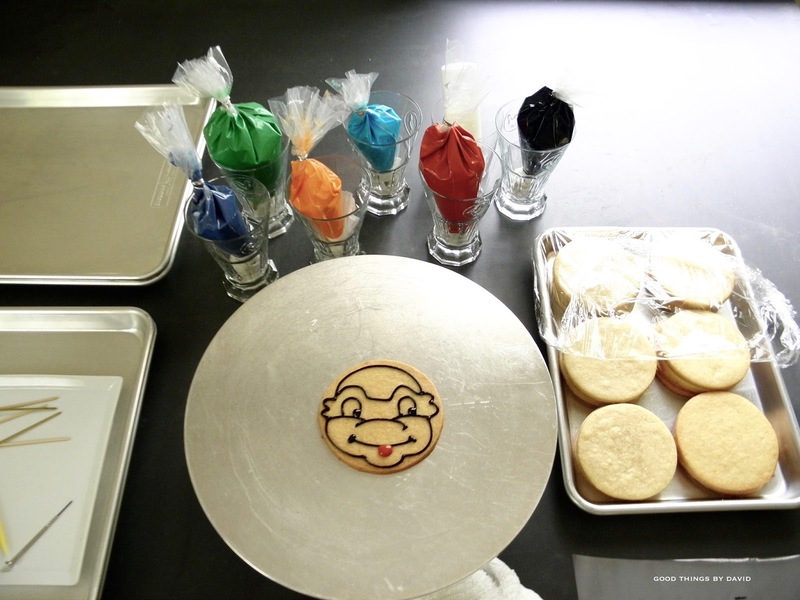 I begin by piping the outline of the entire face in black royal icing using a #2 piping tip. Next, the bandana and eyes get piped, along with the nose bridge and the mouth. I then pipe black pupils either looking sideways or right at you. Fill in the bandana area with either sky blue, purple, orange or red royal icing. It's then a matter of filling in the whites of the eyes and a red tongue. 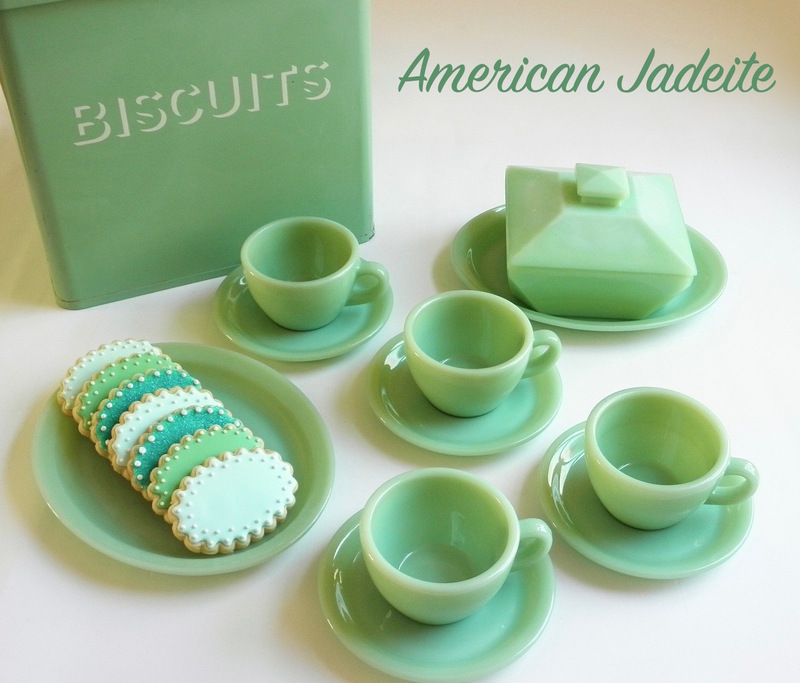 As you very well know by now, I like to work with multiple cookies at a time on my cake decorating turntable, and have the royal icings within easy reach. Since there are four Ninja Turtles, try to make an even number of each character. 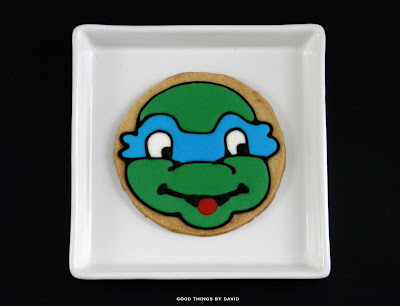 The last part of this cookie is to fill in the face with a bright green royal icing. Do you see how simple this is? Once the cookies have been iced, I then transfer them to flat baking sheets and stack them in one area so that they dry evenly. Here's a good tip if you're finding the icings taking longer than expected to dry (humidity in the kitchen is always a problem): preheat your oven to a very low 175F and then turn it off once it has come to that temperature. 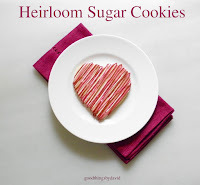 Put the iced cookies, on their baking sheets (stacked crisscrossed), in the oven (make sure that you have turned the oven OFF) and let them sit in there until the oven has cooled down. That low heat will speed up the drying process. I leave them like that overnight. Once the cookies have dried completely, it is then up to you how you want to hand these out. 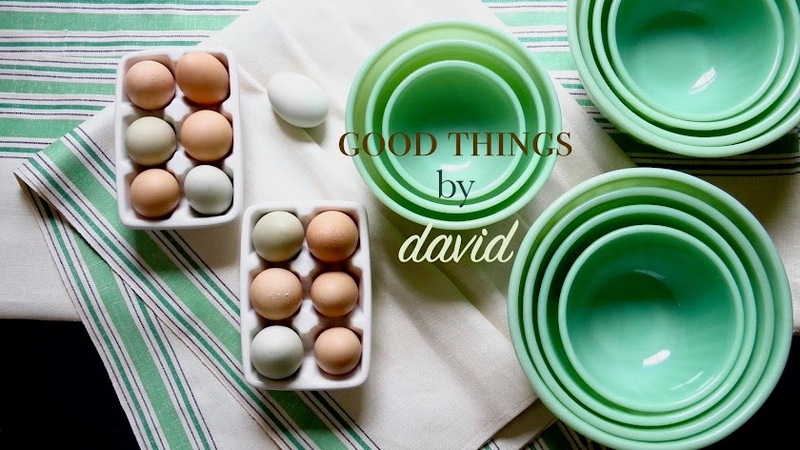 You may want to just put them on cake stands or trays for your kid's birthday party, or you may want to put them in cellophane or glassine bags for party favors. 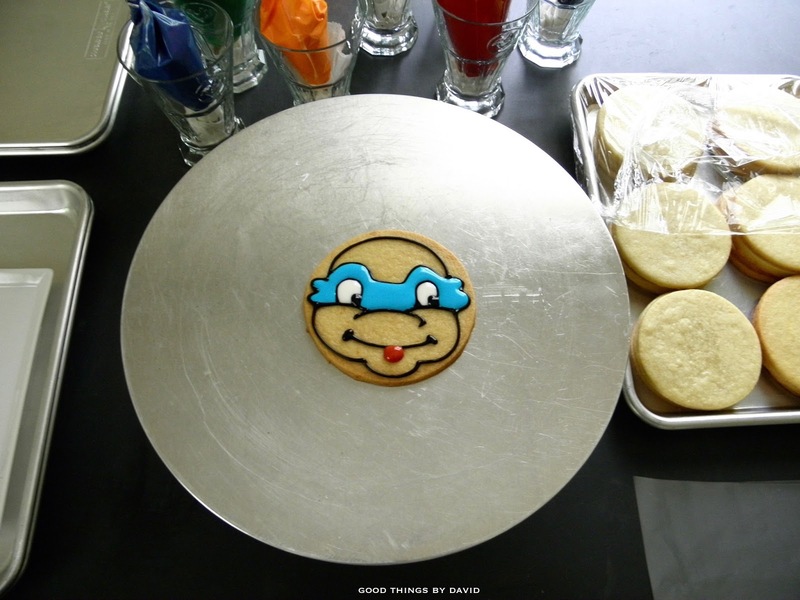 No one will be able to resist a TMNT sugar cookie. Have fun making them! Incredible! I read this post twice, thinking I missed the part about using a KopyKake projector... But, you did these Freehand! Ah-MAZING!